So this week’s episode is entirely dedicated to my top tips for seeking out the best thrifty finds. I’ve always been a thrifty type of person, and I know many of you are as well, so when I set out to actually put into words “how to find really good stuff in thrift shops” it surprised me how lost I was for words to describe “how to thrift”. In many ways, thrift shopping is one of those things that you just “do” and not think about. But if you are new to it, or have never set foot in a thrift store, I can see how one trip leaving empty-handed would be very discouraging! I even have my days when I turn up empty handed and that’s just kind of par for the course I suppose as well. That being said, when I thought about it, there definitely are some things I would recommend - so i’ve offered them up here! This video is about thrifty tips - seven in total, including a list of things I always try to keep in mind when searching and scouring thrift stores for treasure, and I hope you find it useful and informative. If you have anything to add, I’d love to hear in the comments section below. Like I said, I think it’s more difficult then I assume to “teach” thrifting, so I’m always open to suggestions. Next week I’m going to do a children’s clothing haul and it’s a good one so stay tuned! Until next time - have fun thrifting! The last of the dishes are still in the drying rack beside my sink and it rained all day so we played board games and watched the Sound of Music; not because it was too cold to go out and play but because we wanted to just sit and rest and be quiet. It was a 180 from yesterday’s crowded table full of turkey and stuffing, our first time hosting Thanksgiving Dinner. I made gravy for the first time, and stuffing. And it all seemingly turned out - and mike and I navigated the kitchen together with minimal collisions - which is never easy to do when you have more than one cook in the kitchen. I often have people say to me “but I can’t find that kind of stuff at thrift stores” or “we don’t have thrift stores like that around here!” But I’m telling you, the thrift store industry is a 4 billion dollar a year industry; there are stores out there! You just need to develop an eye for recognizing the quality finds. In episode three I share three secrets for honing in on this thrift skill; plus I also share my first ever memorable find - i’ve had it since I was 13 years old!! I hope you enjoy - let me know what you think by leaving me a message in the comments section either on this post or the video! And please, I would love it if you would subscribe to my channel. October first and as I write this the geese are flying low overhead honking to each other as they keep that v-formation. They seem to know exactly when my internal barometer is just precisely ready to embrace the cooler mornings, the chilly evenings, the dulling landscape of the marshes on the outskirts of the river. This is the first true season change for us on this little hill; we moved in at the end of May as so I barely noticed as we slipped from Spring into Summer because I was so consumed with all things unpacking. 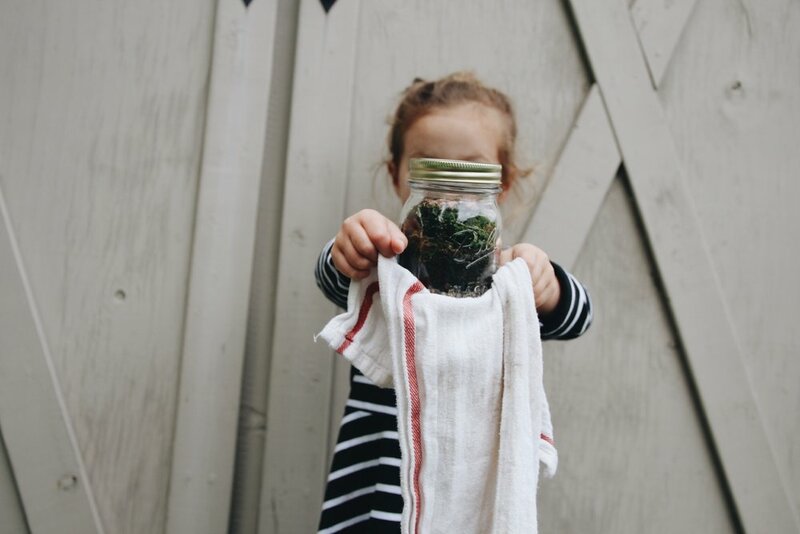 In our efforts to take a bit of this past season with us into the winter, we made a few moss terrariums. I had of course seen the idea on the internet; i immediately liked the idea of a bit of green bottled from our backyard; a little bit of a reminder next February, when the days are snowy and edging on infinite, that hope springs eternal; and that even when it seems like the world has stopped spinning and left us in the dead of winter, the hard work has started behind the scenes and before we know it, we’ll be sitting on a carpet of green again, staring up into the canopy of leaves that bring us so many stories. Rocks or trinkets to decorate it. I saw some tutorials that recommended a glass cleaner for the inside of the jars to prevent fogging. Some other tutorials also recommended using charcoal, the kind you use in fish tanks to help with added filtration. I have read a few different pieces advice concerning care for the terrariums. We are going to keep the lid on ours and water it once a week. I’ll let you know if this works. 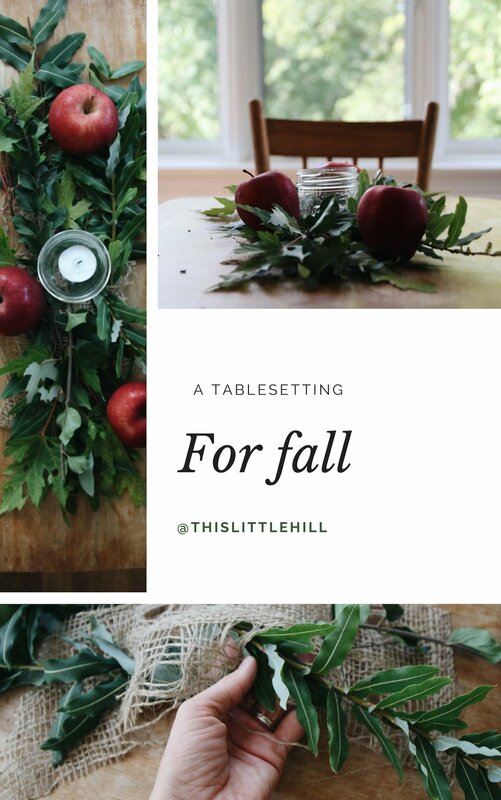 This Little Hill is a lifestyle blog about motherhood, slow living, style and making.